Bitcasa Review from BestBackups, taking a look at features, pricing, security, speed, and customer service. Bitcasa Drive is closing its doors, with all user accounts and data to be removed on May 20th at 11:59 PST. The decision has been made so that Bitcasa can focus primarily on their platform business, and will affect all users. For more information on the closure and how to retrieve your files, you can check out Bitcasa’s Help Center, or contact their Support team directly. In anticipation of the closure, they have partnered with IDrive, who are offering discounts (for a limited time only) to any users wishing to transfer their data from Bitcasa Drive. You can read our IDrive review to find out more about Bitcasa’s recommended alternative, or look into some more options by checking out our lists of the 5 Best Cloud Storage Providers for Windows and Mac, 2016. Although still suffering from the drop in popularity that followed their controversial price hike in 2014, Bitcasa’s software is fundamentally very good. Simple and intuitive to use, it boasts some better-than-average security features and file sharing options, and is a straightforward way to store files online. You can read a detailed review below or sign up now. For those looking to backup a small selection of files, Bitcasa’s Basic plan offers 5GB of storage free of charge. Premium and Pro subscribers can utilise larger amounts of storage space, as well as having access to file sharing capabilities, enhanced customer support and HD streaming. Premium customers pay $10 per month for 1TB of data, while Pro users have to fork out an eye-watering $99 per month for the privilege of 10TB. Premium subscribers get a good deal out of this, with plenty of space for a fairly reasonable charge, even if it’s at the higher end of average. The Basic plan isn’t bad either – offering more than the usual 2 – 3GB of free space, although going Pro is likely to put a strain on the average wallet. Should any of these options appeal to you, Bitcasa accepts payment from most major credit cards. Missouri-based company Bitcasa started out in 2011 as a new player in online storage solutions, and was notable for offering unlimited storage for $10/month. This was a popular approach that gained them subscribers and favourable reviews, but they hit a stumbling block in 2014 when they scrapped the unlimited storage plan, and bumped up their prices considerably. Today, the company is still recovering from the ensuing drop in popularity, and appear to be shifting their gaze towards the b2b market. They released an API in 2014, and new projects seem to be focusing on technological developments more than customer experience. Despite this, they continue to offer personal plans with an interesting array of features – take a look at what I made of their software below. As with the majority of online storage providers, Bitcasa requires you to manually upload your files (rather than doing an automatic full-system backup). You can do this at any time and from any registered device, and there are no restrictions on file sizes or types so long as you don’t exceed your storage limit. Basic users can backup files from a maximum of three devices, while Premium subscribers can upload files from up to five. Bitcasa is compatible with Mac, Windows, Linux, Android and iOS operating systems, and your account can be used to store and sync data across multiple different devices. This means that a file created on an Android phone can be viewed on a Mac without any problems. You can also access your documents from any place, at any time, with just a click of a button. Although Bitcasa did previously offer file versioning, the service is not available at the moment. Any file in your Bitcasa Drive can be shared via email or social networks by using a secure web link. All files are password-protected, adding a layer of security to the process, although it’s worth noting that shared files are stored and sent without encryption so you may not want to share any sensitive information this way. In order to keep everyone up to date, any changes made to shared files are visible to all group members, although the sender’s original file will continue to exist in its unaltered form despite edits made by other users. 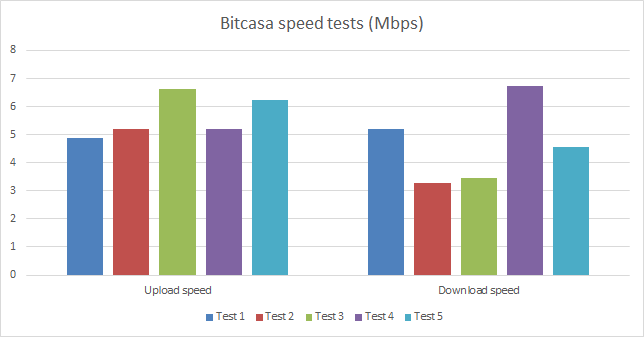 I ran a couple of tests to get an idea of Bitcasa’s upload and download speeds, and found ourselves pleasantly surprised. Working from the same criteria that I use to assess all of our providers, I first manually timed the duration of five file uploads, then calculated the number of MB in each file and divided that by how many seconds it took. From there, I was able to work out the transfer speed in Mbps. With Bitcasa, a 100MB file took around two and a half minutes to upload, with an average speed of 5.6 Mbps overall. Much the same process applies when it comes to retrieving files, where it took a minute and a half to download the same 100MB file, with a top speed of 6.6 Mbps. To make sure that you’ve got all the information at your fingertips, I put all of my results into a graph for your viewing pleasure. Bitcasa’s speeds are significantly better than those of many other storage and backup providers. However, while I do my best to get the most accurate data possible, it’s important to remember that file transfer speeds can also be influenced by external factors such as packet loss and a slow broadband connection. Most backup services will only store files that are currently saved on your computer; so once you delete your copy of a document, it’s removed from your online backup as well. This is because they are designed as a security measure rather than as a place to store excess files. Bitcasa does not conform to this standard – in fact, it advertises itself as something akin to an external hard drive. The Bitcasa Drive is entirely independent of your local drive and can be used to store any files, not just the ones currently saved to your computer. This means that, as well as being a somewhere to backup important documents, Bitcasa can also be used to extend your overall storage space. Bitcasa’s mirroring service is a syncing mechanism that acts as a kind of alternative file backup, albeit with some limitations. When you mirror a folder, it exists on your hard drive as well as being synchronised with your Bitcasa Drive. This means that whenever you alter original versions of mirrored files, their counterparts in the Cloud will be automatically updated. The idea here is that Bitcasa is offering more than just a storage service – also giving users a way to access and retrieve the most up to date versions of their files at any time. Mirroring may extend Bitcasa’s range of features, but it’s not exactly breaking ground, as other storage providers already offer similar file syncing services. What’s more, Bitcasa’s mirroring is not perfect – it can slow down your computer’s processing speeds considerably, and mirrored files are read-only when accessed from other devices. Bitcasa’s security features are mostly very good – the initial encryption of your data is performed client-side using AES-256 bit encryption (so has the big advantage of being end-to-end), and all files are sent using SSL over secured connections. Data is then sent in small encrypted blocks to the Bitcasa server, where it is stored. The process is reassuringly thorough, and also boasts another important feature – the ability to set a private encryption key. This is a password from which a key is generated to encrypt your files, which is set by you and never seen or stored by Bitcasa in its plaintext form. This means that the company simply does not have the ability to view your unencrypted data, so if they are hacked or issued a subpoena to hand over your data, they won’t have the information necessary to access your files. On the downside, they do offer a password restore service in case you forget your details. While this does mean that you won’t find yourself permanently locked out of your account, any company that can reset your password can also access your data. It’s that simple. In order to keep your data private, Bitcasa uses a technique called convergent encryption, which allows the company to deduplicate files without decrypting your data. This essentially helps to keep your storage use to a minimum, as it identifies which of your files already exist in the cloud, and then ensures that unnecessary duplicates are not saved. When you’ve got a limited amount of space available, this is a useful facility; however, it does have some vulnerabilities – primarily that someone could discover whether or not you have a specific file just by possessing a copy of it themselves. If you run into any problems using Bitcasa, there are a few routes you can follow to resolve them. Their website features a built-in email service which can be used to send queries, as well as a LiveChat that operates between 7 am and 4 pm PST from Monday to Friday. Our experience with the email system was excellent, while the LiveChat gave us a simple and concise answer to our question although, being based in Europe, we had to pick our moment to contact them. There is also a Getting Started Guide and a basic FAQ, although both are scarce in detail and don’t offer much by way of in-depth information or troubleshooting. They might be helpful when you’re first getting to know Bitcasa, but are unlikely to be of much use to more established users. We received a response to our email enquiry within just three hours, and were given all of the information we were looking for, as well as some useful links to further reading. The reply was friendly and personalised – clearly the work of a real employee, not a bot. In October 2014, Bitcasa altered their price plans, scrapping their previous offer of unlimited storage for $10 per month. The changes were made on the grounds that the underlying business plan was untenable, as only a very small percentage of users were making use of more than 1TB of space. Unfortunately, existing customers with lots of data did not come out of the new arrangement well, with those not wanting to subscribe to the ten percent price increase told to download their files within 23 days or lose them entirely. This ultimately resulted in a court order extending the period by a further four days, in order to facilitate users whose file restoration had not yet completed. There were also complaints that customers had been charged the new prices without consent, and that many people had lost data as a result of the changes. The dust has settled somewhat now, but Bitcasa’s reputation for customer service has not yet fully recovered, although new customers are unlikely to feel any negative effects today. If you’d like some more information, take a look at TechCrunch’s overview of the situation. Bitcasa maintains a blog, as well as Twitter and Facebook accounts. All are updated fairly regularly, although most contain roughly the same content. The blog is a relatively serious affair, featuring factual and promotional articles on Bitcasa’s products. Their Twitter and Facebook accounts are both a little more accessible, and post frequent articles on the company as well as links that cover topics including web development and online security. There is also a Bitcasa Support profile on Twitter, although it mostly features maintenance updates rather than tailored responses to customer inquiries. Bitcasa is easy to set up – just enter some fairly minimal details online, then download the Drive. I didn’t encounter any issues during this process, and setup completed quickly. The Bitcasa Drive is essentially a folder on your computer where you can add, remove or edit the documents you want to backup. It’s incredibly easy to use, and very intuitive – all you need to do is move or copy a file to the Bitcasa Drive folder, and it’ll be backed up to the cloud. You can also upload documents via their website, or by right clicking the desired file and then selecting the option to “Copy this to Bitcasa”. Downloading and sharing files is straightforward, too – from the website, just select the file (or files) you want, and a series of icons will appear on the page. You can then choose to delete, move, copy, download or send them to a friend. Sending a file will generate a secure link, which you can share automatically to Twitter or Facebook, or copy and paste to your desired location. One of the nice things about Bitcasa is that all of its functions are very clearly displayed, and can be accessed with just a click. It’s simple, but it also works well and is very accessible to less experienced users. The Bitcasa mobile app is no more complex than its desktop counterpart – simply log in, and you’ll have instant access to your backed up files. You can download documents quickly and easily, as well as uploading photos from your phone’s gallery. Everything is quick, and navigation isn’t difficult – you can even tell the app to automatically backup all newly taken photos to the Cloud. The bare bones of Bitcasa’s software are good, with a simple but effective design and impressive ease of use making it stand out against the competition. Reservations about the company are understandable, however – leaving it up to you to decide whether the program itself is worth potentially facing more short-notice account changes in the months and years to come. Stay away, not worth it. I was sent an email that Free bitcasa was ending. I then went to download any of my files from the system. When I got down to the last ones, I noticed the files were not downloading completely(8 MB file only downloaded 15k). I then sent in a support request asking for help. I did receive one response where a tech simply asked me to provide a link to the files and he would try to download on their end. The very next response I got was from a support manager who closed the request as RESOLVED with the statement that they were discontinuing service. What a lame response from support. I expected more but was sadly disappointed to say the least. No wonder they are closing if that’s the kind of responses they send out. First I spent ages to get their service to work consistently (after paying for their “unlimited plan”). When finally they do a major set of bug fixes which seems to have fixed most of their issues, they downgrade the Unlimited Plan to a limited plan on very short notice. I tried to download all my data before the change but was not able to do so because their service was too slow. I cancelled my service soon after that as I did not want to deal with their games anymore. I kept my account around with the free 5GB limit. I just received notice that the free 5GB plan has now been converted to a 60 day trial. I will delete my account and good riddance. All other services (Dropbox, Box, Google Drive, OneDrive) I have tried are far superior to Bitcasa. They seem to pay for articles such as this one, because the only recommendation one can give for Bitcasa is “look elsewhere”. Thanks for your review Gerald – we’ve altered our review to cover Bitcasa’s changes to their free plan, and have also amended our overall rating of Bitcasa’s service as a result. We hope that our site can help you find an alternative provider to use – if you’d like any advice on which services might best meet your needs, let us know and we’ll be happy to help. What an unethical company. They changed their guaranteed unlimited plans and raised prices drastically with 23 days notice. They screwed up data migration process. They auto-renew your subscription without giving you a notice (i.e. an opportunity to cancel). Refuse to give partial refunds. Transfer speeds are slow. Customer service is not helpful or knowledgable. Overall a very shady company that I do not recommend doing business with. What do you think of Bitcasa? Leave your thoughts in a comment.